Chicken Kabobs for Father’s Day – Pass the Meat! Learn to make Honduran Tamales from food blogger Brad Nierenberg. Feast your eyes on my Father's Day chicken kabobs! Brad Nierenberg's gift for a few neighborhood moms this year was a delicious Crepe Cake. Get the recipe! Get a taste of both the food and daily life throughout Italy and book reservations at an agriturismo. Try my pork chop casserole with stuffing and apples. It is easy to prepare and simply delicious! You will never want regular chicken and biscuits again after you try mopping up the gravy on this spicy French version! Read these tips on how to cut costs on New Year's Eve. Charge the fitbit! You'll need to add a few more steps after you try these delicious Peanut Butter S'more Bar Cookies. Get the recipe. What a treat! A dear friend from Honduras called and invited me to come over for the day to make Tamales with her and her mom who was visiting from Honduras. I jumped at the chance and man oh man am I happy I did! I think most people are familiar with Mexican Tamales. But according to my friend most Spanish-speaking countries have their own version of the savory treat. In Honduras they are typically prepared for Christmas. That’s probably because they really do take an entire day to make. Start with a 3-5 pound piece of pork. We used a boneless tenderloin, but a bone-in piece is fine. Cut the meat into chunks about 2”x2”. Brown the pieces of pork in some chopped onion, crushed garlic, and oil. Puree 4 roma tomatoes, 1 onion, 1 green pepper, 4 cloves of garlic, adobo seasoning, cumin, Worcestershire sauce, and cilantro in a blender or food processor. Pour over meat and simmer for 30 minutes. Add a small can of tomato paste and continue to simmer until tender. Taste and adjust for seasoning. Sidenote: I was super surprised they used Worcestershire sauce in their cooking. My friends actually referred to it as sauce of the English. Ha, ha! Peel and cube 1-2 potatoes into 1” sized pieces or smaller. (Not too tiny or they will fall apart in the Tamale.) In a frying pan brown 1-1/2 cups rice and the potato cubes together in butter, oil, or a bit of each until the potatoes are softened. Pour a small bag (or half of a larger bag) of cornmeal into a large pot. In the blender, puree 4 roma tomatoes, 1 onion, 1 green pepper, 4 cloves garlic, adobo seasoning, cumin, and Worcestershire sauce. Pour it into the pot of cornmeal. Add all the juice from one jar Spanish olives and all the juice from one jar of capers. Add about 1 cup of water and 1 cup oil. Add 1-2 packets of achiote (also called annatto) powder for color. Mix by hand. Keep adding small amounts of water until it mixes more easily, but is not too soupy or runny. You may want to add another 1/2 to 1 cup of oil. This will keep it from lumping while cooking. Taste for seasoning and adjust. It should be flavorful and not too bland. Cook on medium heat while constantly stirring until thickened and with a slight sheen. Unravel a package of banana leaves and rinse them well in clean water. Pat dry with paper towels. Cut each leaf into 6-8” sections. Tear pieces of aluminum foil into 8-9” sections. Stack the leaves and foil together so that each piece of banana leaf rests on a sheet of foil. Make sure the shiny side of the leaf is against the foil. Pour into separate bowls a jar of olives, a jar of capers, a cup of green peas, and a cup of raisins. You’ll also need your pan of rice and potatoes as well as the pot of meat and the cornmeal mixture. Lay one banana leaf segment on its foil in front of you. Spoon about 1/2 cup of cornmeal into the center of the leaf and flatten it slightly with a spoon (or fingers). Place a small chunk of pork and some of the sauce onto the cornmeal. Add a spoonful of the rice/potato mixture, 2 olives, a few raisins, and a few capers and peas. Starting from one corner, roll the Tamale into a tight cylinder. The foil should keep it closed. Sidenote: In Honduras they don’t use the layer of foil. There is another part of the banana plant used as string to tie the rolled banana leaves up into a tight little packet. I guess you could also use string, but the foil worked great. Tightly pack the foil packets vertically into the bottom of a large pot. Pour boiling water into the pot. It should come up to the top of the foil ends. Bring the pot up to a boil, lower heat and cook covered for about one hour. After an hour, open and test the inside of one Tamale for doneness. The rice should be cooked. Hopefully you will end up with so many Tamales, you’ll need to cook them up in 2-3 batches! That’s what we did. Step Eight – The Best Step – Eating Tamales! You can either serve your hot Tamales right away, or save them for later. I reheated mine by placing several in a baking dish and baking at 350 degrees for about 20-30 minutes (or until hot). They are better the next day after all the flavors have had a chance to love on one another! We made about 40 Tamales. My friend was right….making Tamales took us all day! But as a group activity it was a blast. We used the boiling time to eat lunch and we laughed and talked the entire time. I don’t speak a word of Spanish, but since cooking is an international language, her mom and I had no trouble communicating! I hope you give Honduran Tamales a try. If you make a different version, feel free to share your recipe below! Next on my bucket list is to meet up with a few friends from El Salvador and learn how to prepare pupusas! When I last blogged, it was to share pictures from a delightful Crepe Cake I prepared for a Mother’s Day gift. Yesterday, I invited a few father friends over to burn meat and relax over a few beers. Kabobs are a great option when serving a group. A little meat goes a long way! And I was able to gather up a variety of veggies and grill them up for a colorful and delicious meal. Another things I really like about kabobs is that you don’t have to prepare a lot of side dishes because everything you need is on the skewer! All I added yesterday was watermelon and a side of baked beans. They guys were happy! Chicken Kabobs the Easy Way! If you’ve read any of my past posts, you know I am hooked on Aldi’s for most of my shopping. It saves a ton of money and they carry a lot of neat things not found at most grocery stores. I think that’s because they originated in Europe, so the selection of some German food stuffs is pretty darned good. To make a long story short, I purchased at Aldi’s two packages of marinated cilantro-lime boneless chicken breasts and cubed them up for the meat. Easy, right?!?! I basically dug through my fridge to grab everything else added to the kabobs. Skewer the cubed meat and vegetables in any order. Lay onto a preheated grill and turn regularly until the chicken is cooked and the veggies have a nice char. Serve hot. Happy belated Father’s Day mates! I hope you enjoyed your afternoon. If you have any favorite kabob marinades or kabob recipes, send me the link below. I’d love to try them! I’m friends with a few moms and wanted to treat them to a special treat on Mother’s Day. I looked through several recipes and settled on a Crepe Cake. I’d never made one before, but I’ve whipped up plenty of pastry creams and millions of pancakes so I figured it would be a cinch! Okay, truth be told, it was not exactly a “cakewalk!” I had a few layers slide this way or that. It may not be as pretty as a pro would bake, but it tasted like a slice of heaven. And the moms I shared it with were amazed! Step One: Make the batter. Make batter several hours in advance. Melt butter in a small pan until it turns medium brown. Separately, heat milk until steaming I used a microwave). In a stand mixer beat eggs, flour, sugar, and salt on medium speed. Slowly add the slightly cooled milk and browned butter. Pour into a container with a spout and refrigerate for several hours. Step Two: Make the cream filling. Bring milk to a boil in a heavy bottomed saucepan. Remove from heat and stir in the vanilla. Fill a large bowl with ice and set aside as an ice bath for the finished cream. In a separate heavy-bottomed pan, whisk together the egg yolks, sugar, and cornstarch. Gradually whisk in the hot milk and bring to a boil over medium high heat. Whisk constantly 1-2 minutes. Scrape into a small bowl. Set the bowl in the ice bath and continue stirring until the temperature drops to 140 degrees. Stir in the butter. When completely cool, cover and refrigerate. Whip the heavy cream, sugar, and Kirsch (optional – you can substitute vanilla, another sweet liquor, or even almond flavor). Fold into the chilled pastry cream with a spatula. Bring the batter back to room temperature. Place a 9-inch crepe pan (or non-stick) over medium heat. Brush with oil. Pour about 3 tablespoons batter into hot pan and swirl to cover the surface. Cook until the bottom just begins to brown, like a pancake, then carefully peel back and flip. Cook on the other side for 5 seconds. Flip the cooked crepe onto a piece of parchment paper. Place 1 crepe on your cake plate. Cover with a thin layer of pastry cream (about 1/4 cup). Add crepe #2. Repeat steps until you finish with the last crepe on top. Set out for 30 minutes before serving. Slice and serve with fresh fruit. I must say, this was one of the most time-consuming cakes I’ve ever made, but it was well worth the effort! Let me know if you have any other variations on the Crepe Cake. I have a feeling that these babies get better with practice! I love the taste of pasta tossed with fresh tomato sauce. It’s one of those guilty pleasures in life worth the time and effort. Even though it’s not exactly fresh tomato season, you may want to save this article for a day this summer when you are wondering what to do with that bushel of ripening tomatoes. 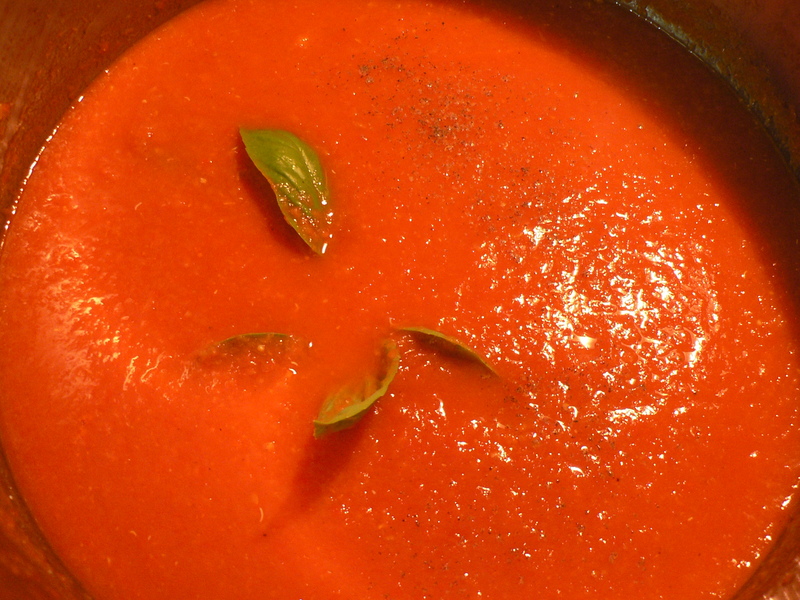 The beauty of tomato sauce is you can use bruised and even slightly over ripened tomatoes. If you use several varieties of tomatoes your sauce will have a richer flavor. Another way to add flavor depth is to roast some or all of your tomatoes first. I sometimes opt to roast cherry tomatoes before adding them. They take far less time to roast. One question I get asked a lot is whether I go to the trouble of peeling all the tomatoes before I cook with them. The answer is no. That’s because I use a food mill which removes all the peelings for me! 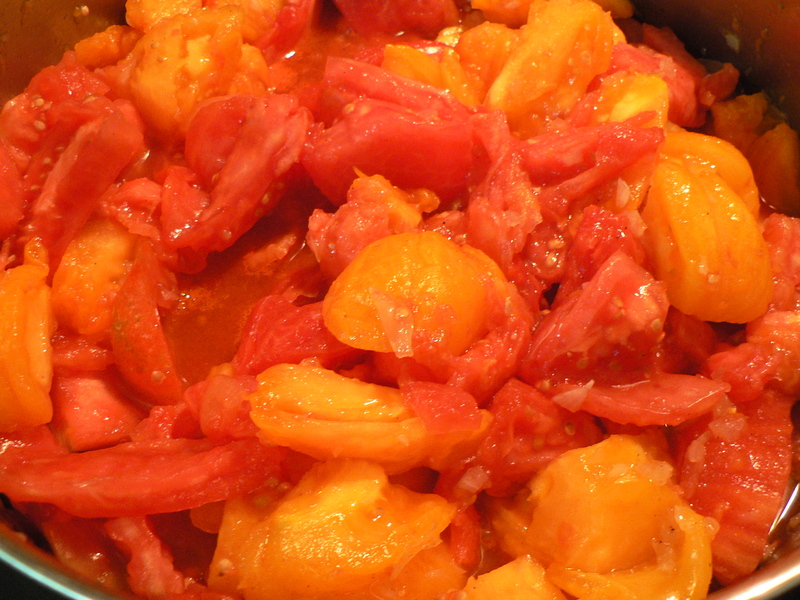 Chop tomatoes into large chunks and add to large stock pot. Cook down on medium heat for 45-60 minutes. This time will vary depending upon how much water is in your tomatoes and how thick you like your sauce. 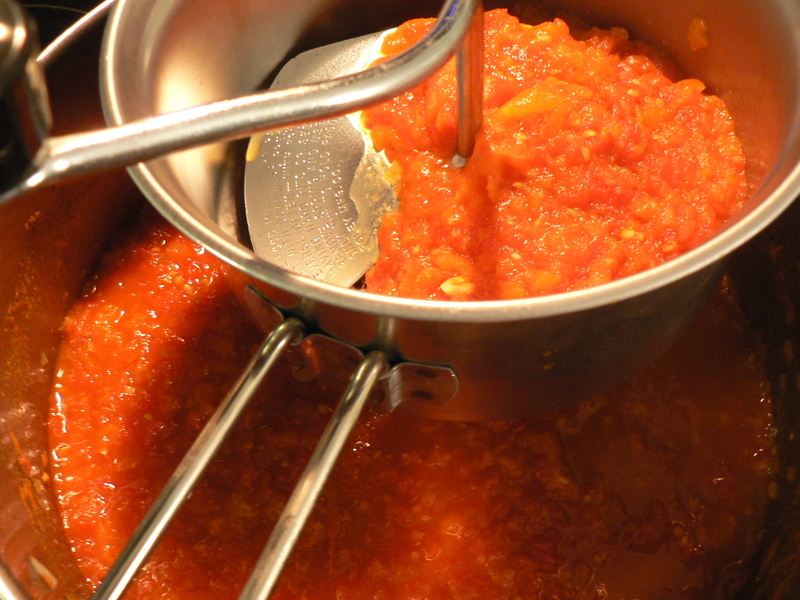 In batches, run cooked tomatoes through a food mill to remove all skins and seeds. Add seasoning (whatever you prefer) and simmer 10-15 minutes longer. 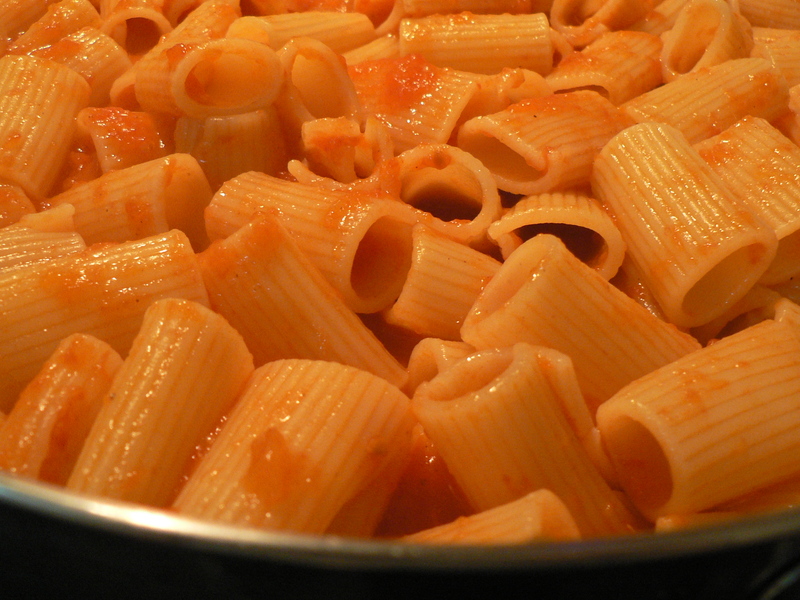 Cook pasta in salted water to desired doneness. I prefer some bite to my pasta. Toss hot pasta with sauce. Taste and season as needed. Top with freshly grated parmesan cheese and serve immediately. Less is more when it comes to fresh tomato sauce. But that’s just my opinion! If you’ve never used a food mill, they work great for sauces and soups. And, if you are ambidextrous, it counts as an arm workout too! What’s your favorite way to prepare tomato sauce? I have a few friends visiting Italy this spring and wanted to share some of my insight. I was lucky enough to spend close to two years living in Northern Italy back in the early 2000s. I loved it. How could you not?!?! Travelers flock to Italy every year to enjoy the beauty, the art, the history, and the food and wine. Unfortunately, most tourists focus on the large cities like Rome, Florence, Milan, and Venice, missing the opportunity to immerse themselves in the daily life and culture of this wonderful country. Food is a central aspect of Italian culture and it differs from region to region and even town to town. One way to get a taste of both the food and daily life throughout Italy is to avoid hotels inside city boundaries and book reservations at an agriturismo or two. These visitor-friendly working farms are located in the countryside. They range in cost and amenities. Most include breakfast and some book dinner reservations as well. Dining at an agriturismo is a culinary delight. The menu features seasonal local ingredients, including a few raised right there on the farm. Visitors will experience the cuisine of that particular region. If staying in the Piedmont, truffles may find their way onto the menu along with a hearty barolo wine if you are lucky! The stunning Cascina Barac is one such farm hotel, set in the vineyard. Visitors can book reservations for a gourmet meal, taste their wines, and even tour the family-owned winery. I still make the shaved carrot recipe I was served there. The owner wrote it down for me on the back side of a business card which holds a place of honor in my recipe box to this day! Is Florence on your list? I stayed at the Macinello in Montegiridolfi to visit the region. Make sure you get over to Greve for some Chianti! There is also an American cemetery nearby well worth a visit. Venice is located north of the province of Emilia-Romagna of the famed pasta bolognese, parmigiano-reggiano cheese, and lambrusco and sangiovese wines. Why not book reservations at a local agriturismo and use it as your base to visit Venice, Ravenna, Modena and other beautiful cities? Umbria is another region in Italy often overlooked by American tourists, but honestly it was one of my favorites. Perugia (yes, the chocolate is named after this old city), Spoleto, Assisi, and many other beautiful hillside towns dot the countryside. I stayed at the La Quercia Gentile in Valfabbrica as my base. The owners were so nice that upon leaving they gave me a big bottle of their own olive oil to try! The region is known for its Pecorino cheese and egg pasta. Sangrantino and Orvieto are the regions most popular wines. To really experience Italy, get out into the countryside. Book a room or suite at a farm hotel. Chat with the owners over a meal. Investigate the little villages and sip a cappuccino from the local bar. Hike. Meander. And eat where the locals dine. This way you will experience the true Italy. Visit the website Agriturismo website to investigate properties and book your reservations. I’ve had to dial back my love of home cooking for a couple of months. I need to take off about 10 pounds and so am avoiding time in the kitchen until mission accomplished. I’m trying to cook and eat healthy options, but so far am uninspired to share anything of note. I’m keeping my eyes peeled for some great looking and tasting dinners and hope to be back to my culinary roots soon! But, as you can see by the title, I took a vacay from dieting yesterday to celebrate a friend’s birthday and thought I would share some pics and tips. After all, if you are going to fall of the dieter’s wagon, you may as well fall hard! The morning started out with some cinnamon rolls. I confess I kind of cheated. They were a last minute idea and I used what I had in the freezer, frozen bread dough, which had been tucked away as forbidden food for the past few weeks. I thawed two loaves overnight in the refrigerator, then got to work in the morning. No recipe is required. This is one of those “wing it” recipes! Roll out softened bread dough into two rectangles. Spread with softened butter, leaving about 1/2-1/4″ border all around edges. Spring liberally with brown sugar and cinnamon while retaining the same clean border. Roll and seal the ends. Slice and place in a buttered baking dish. Cover with a clean dish towel and set in a warm place to rise for 30 minute. Please in a pre-heated 350 degree oven for about 30 minutes or until done. (I use the “touch with finger for doneness” test). Eat while warm. That’s it! There is no hidden secret to these delicious cupcakes. I just wanted to share a couple of photos. I used a boxed chocolate cake mix and Ina Garten’s peanut butter frosting. Her frosting recipe is one of my favorites. It is so creamy and delicious and always gets loads of compliments. All 24 cupcakes were eaten in a flash. Thank goodness, because today I am back on the bandwagon. I love pork chops. They are inexpensive and delicious as long as you don’t cook the dickens out of them. We grew up eating pork chops fairly often because of the low cost. My favorite way was with stuffing and applesauce on the side. I stumbled across a recipe from one of my most tattered cookbooks the other day that put the stuffing, apples, and pork chops all together for a very easy to prepare (and tasty) casserole of sorts. I made a few alterations of my own which I explain below. For the original Betty Crocker recipe (which is hard to improve upon) you can visit their website which is probably a bit easier than borrowing my cookbook! Mix these ingredients together until moist (not mushy) and keep tasting for right amount of seasoning. Brush 1/2 teaspoon butter in bottom of 13×9-inch baking dish. Spread apple slices in dish. Sprinkle brown sugar and cinnamon over apples. Season the pork chops with whatever spices you prefer and lay on top of apples. I used a combination of salt, pepper, garlic, sage, paprika, thyme, and all spice. Cover pork shops with stuffing. Cover with foil and bake at 375 degrees for 40-50 minutes. Uncover and bake 10-15 minutes longer until you get a nice browning on the stuffing. See how easy that is! Enjoy!